The Yeti Pro is the world's first USB microphone combining 24-bit/192 kHz digital recording resolution with analog XLR output. Featuring three custom condenser capsules and four different pattern settings, the Yeti Pro can capture digital audio with up to four times the clarity found on CDs. Plus, the Yeti Pro features a cutting-edge A-D converter chip and separate analog circuit path for use with professional studio mixers and preamps. You also get a built-in headphone amplifier for zero-latency monitoring, and direct controls for headphone volume, pattern selection, mute, and microphone gain. So whether you record at home, in a studio (or in the Himalayas! ), the Yeti Pro is your ultimate sound solution. Quickly select any of the four pattern settings by rotating the pattern selector knob. The legend of the Yeti continues with the most advanced and versatile multi-pattern USB microphone roaming the wild today. 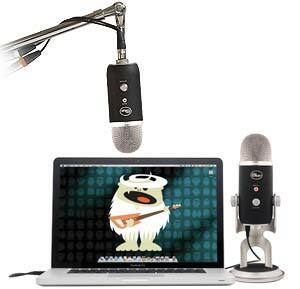 The Yeti Pro features tools and recording capabilities usually requiring multiple microphones and devices, all with the simplicity of a plug-and-play USB microphone. 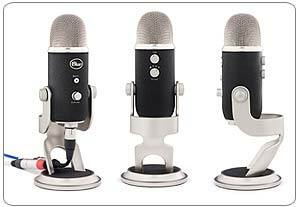 The Yeti Pro is like having four mics in one, thanks to its built-in pattern selector. Choose between four polar pattern settings for any home recording application. Select Stereo for capturing a realistic, two-channel stereo image. Cardiod is the most commonly used mode for basic recording and is useful in almost any situation, such as recording vocals, a podcast, voiceover work, and more. Omnidirectional mode is perfect for recording a group of musicians playing at the same time, or recording a conversation between multiple parties around a room such as a conference call. Choose Bidirectional for individual instruments, or for recording an interview with two or more guests. Its versatile application along with simple plug-and-play functionality makes the Yeti Pro the only desktop microphone you'll ever need. The Yeti Pro features a custom base, including a threaded mic stand mount with cable management. A USB cable and a stereo XLR breakout cable are also included in the box. The Yeti Pro is the world?s first USB microphone combining 24 bit/192 kHz digital recording resolution with analog XLR output.Featuring three custom condenser capsules and four different pattern settings, the Yeti Pro can capture digital audio with up to fourtimes the clarity found on CDs. Plus, the Yeti Pro features a cutting-edge A-D converter chip and separate analog circuit path for usewith professional studio mixers and preamps. You also get a built-in headphone amplifier for zero-latency monitoring, and direct controlsfor headphone volume, pattern selection, mute, and microphone gain. So whether you record at home, in a studio (or in the Himalayas! ),the Yeti Pro is your ultimate sound solution.